Anne Frasier was born on April 10, 1893, in Boston, Massachusetts, to Charles Warren Frasier, a steam engine driver for the Boston Fire Department and Catharine Walsh Frasier. Unfortunately, Anne’s mother passed away when Anne was only nine. This tragedy was compounded by Anne’s father being hurt on his job which necessitated moving the family to New Hampshire where her father took a new job. Anne, who by this time preferred to call herself Annie, was enrolled in Pinkerton Academy, a large private secondary school in Derry, New Hampshire. Here she excelled and graduated in 1911. Continuing her education, Annie continued her studies at Bryant and Stratton Business College in Boston, and shortly after graduating from this institution, she married Edwin Asa Norton who had been a classmate at Pinkerton. When the United States entered World War One, Edwin enlisted in the U.S. Army and was sent to field artillery officer candidate school in Kentucky. Not content to sit around and wait for him to return home, Annie traveled to Portsmouth, New Hampshire, and on August 10, 1918, joined the newly established Naval Coast Defense Reserve. 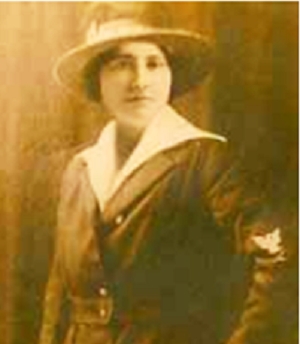 Because of her secretarial experience, Annie was enlisted as a Yeoman Second Class (F) and was soon assigned as a stenographer and secretary to the newly appointed Commandant of the Portsmouth Naval Shipyard. Much to the sorrow of all who knew her, Annie’s service would be cut very short by the deadly and fast-moving influenza epidemic that would further decimate a world population that had already absorbed grievous war casualties. Annie became ill on October 9, 1918, was hospitalized in the Naval Shipyard Hospital, and died the next day. Annie’s body was escorted to Massachusetts where she was buried at Woodlawn Cemetery in Everett. Interestingly, Annie was escorted by a group of women serving in the Navy who acted as pallbearers and she was buried with full military honors. Thus, many historians have honored Annie Frasier Norton as the first woman member of the U.S. military to die while on active duty. Some have debated this distinction because of women Army nurses that perished before her although the nurses were generally considered Army employees and not active duty personnel.